Strongest, most reliable, with unmatched repeatability. The ATI Robotic Tool Changer provides the flexibility to automatically change end-effectors or other peripheral tooling. These tool changers are designed to function reliably for millions of cycles at rated load while maintaining extremely high repeatability. For this reason, the ATI Tool Changer has become the number-one tool changer of choice around the world. ATI Tool Changer models cover a wide range of applications, from very small payloads to heavy payload applications requiring significantly large moment capacity. What is a Robotic Tool Changer (QC)? An end-effector with two mating parts, a Master-side and a Tool-side that have been designed to lock or couple together automatically, carry a payload, and have the ability to pass utilities such as electrical signals, pneumatic, water, etc. 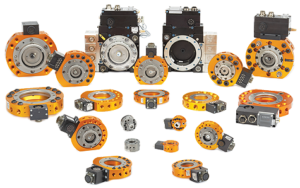 Most robot couplers use pneumatics to lock the Master- and Tool-sides together. The Robot Tool Changer provides the flexibility for any automated process to change tools and pass various utilities. The Master-side of the Tool Changer mounts to a robot, CNC machine, or other structure. The Tool-side of the Tool Changer mounts to tooling, such as grippers, welders, or deburring tools. A Robot Tool Changer is also known as a Quick-Change device (QC), an automatic tool changer (ATC), robot tool changer, robot coupler, robotic coupler, or robotic connector.